Meet the authors and the artist behind the Hoard’s Dairyman bookstore’s newest releases at three book signings. At Hoard’s Dairyman, we are extremely lucky to work with talented professionals from across the entire spectrum of our dairy community. From feed and nutrition to farm finance to inspired artists, we work with the best of the best. 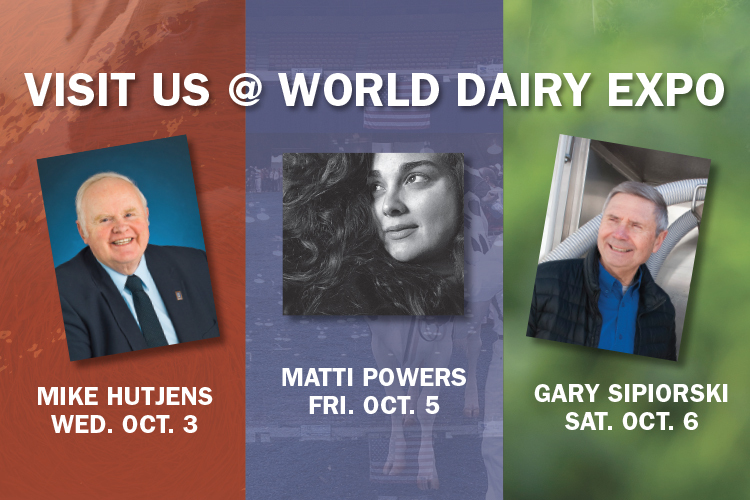 This year at World Dairy Expo, we are offering three opportunities to meet and interact with a few of our favorite contributors, whom we have worked with to create new resources and sources of inspiration for all to enjoy. Mark these events on your calendar, and we will see you at the show! All book signings will be held at the Hoard’s Dairyman booth in the lower level of the Coliseum as you enter from the barns (Arena Level –AL 213 & 217). Mike Hutjens is a renowned dairy extension specialist, and feed and nutrition expert from the University of Illinois. Follow Mike to the Coliseum after his Forage Seminar in the Arena Building to interact with the author, and maybe even get a picture with him and your signed copy of the Feeding Guide. This release marks Mike’s 4th edition of this text, and boasts ample updates to better fit the needs of today’s dairy farmers with new sections on robotic feeding, high-digestibility forages, and feeding strategies for increased herd production. Matti Powers grew up on a small hobby farm outside of Clinton, Wis. with summers spent showing heritage poultry, exploring the woods around her house, and writing and illustrating stories with her two sisters. Her art is inspired by the writings of Brian Jacques and C.S. Lewis, and her desire to make people smile when they see her collection of whimsical animal friends. Her beautiful illustrations are paired with some of the most beloved stories written by Wisconsin’s David (Dr. Dave) Dickson in the Christmas in Dairyland poem book, and help make his words come to life! Gary Sipiorski has worked directly with feed dealers, consultants, and dairy farmer throughout his career, starting with Ralston Purina (Purina Mills), and as he worked his way up from agricultural loan officer to president and CEO with the Citizens State Bank of Loyal. Currently a Dairy Development Manager for Vita Plus, Gary is on a mission to share the importance of smart money management. Over the past 20 years, Gary has worked towards this mission through his Money Matters column in the Hoard’s Dairyman magazine. His note-worthy advice has been culminated into a resource for farmers, aimed at providing bite-sized lessons for improved dairy business management. Come say “hi” to Gary at World Dairy Expo, and get your copy of this highly anticipated release! Stop by our booths to learn more about these new offerings. See you at the show!